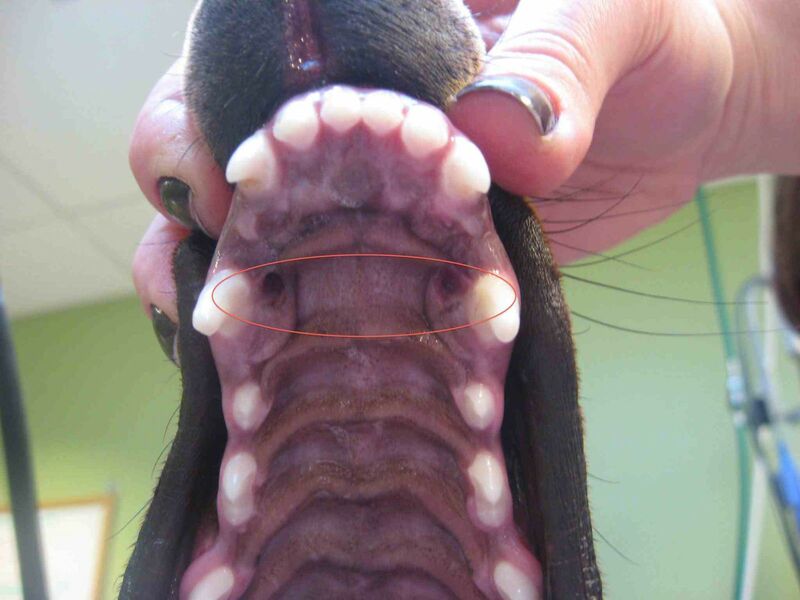 The most common orthodontic abnormality seen in dogs is base narrow canines. In this condition the lower canine teeth are angled straight upward, instead of tipping outward. Some patients may display only mild contact of the affected canines with the upper gums, requiring minimal intervention. Others may show direct traumatic contact with the tissue of the upper hard palate and secondary deep defects can occur. These contact points are painful, and require correction as soon as possible, even if overt signs of pain have not been noted. Base narrow canines can develop for many reasons. Persistence of the deciduous lower canines ("retained baby teeth") is a frequent cause of this malocclusion. If the deciduous canines fail to exfoliate in a timely fashion, the permanent canines can be displaced. Often times, the persistent deciduous canines are also base narrow in orientation. Another cause for the base narrow positioning is jaw length discrepancy. Overbite dentition (type 2 malocclusion) places the lower canines in an abnormal position. The lower canine teeth in this state may not clear the upper tissue without trauma. 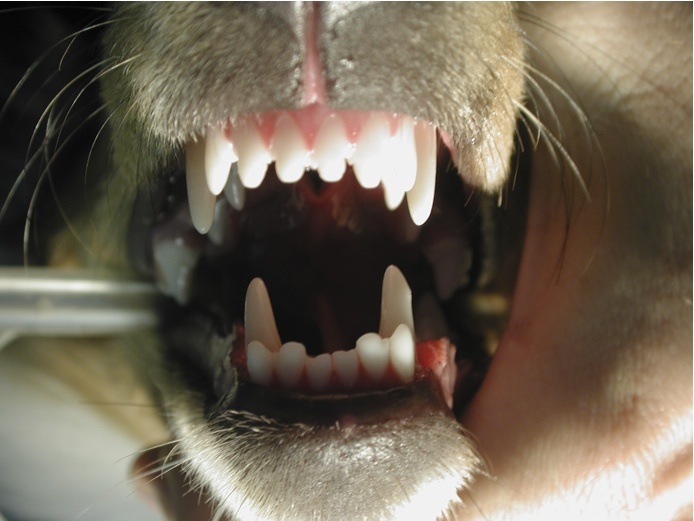 In some cases the lower canines are trapped to the inside of the upper canines. This can result in contact trauma to the upper canine teeth, putting their long-term health at risk. 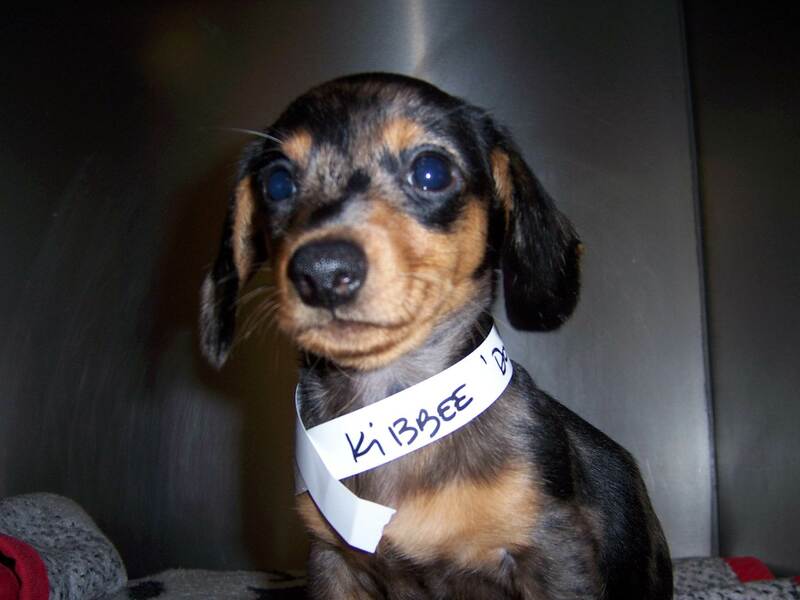 For base narrow canines in puppies, extraction or orthodontic correction are viable options. Both treatments eliminate discomfort from traumatic tooth-to-palate contact. If extraction is elected, careful controlled removal of the tooth must be achieved with care to avoid damaging the unerupted adult tooth. It is especially important for a clinician to understand the normal anatomy and the positional relationships of the deciduous teeth with respect to the permanent teeth. As with any dental extraction procedure, pre-operative dental radiographs are obligatory. Anesthesia must be tailored for the juvenile patient with appropriate medication, careful monitoring, and a good pain control plan. Extraction may help with positioning angles of the erupting adult canine teeth but success is variable. For juvenile patients with an overbite, removing the deciduous canines at an early age can also allow for maximal growth of the lower jaw. If orthodontic treatment is elected, application of composite crown extensions (aka camouflage orthodontics) may be considered. The tips of the base narrow teeth are artificially repositioned higher and further lateral (to the outside) with dental acrylic material. The prosthetic tips clear the lateral upper jaw, and thus encourage orthodontic movement of the misaligned teeth. No second anesthetic procedure is necessary to remove the acrylic as the teeth will naturally exfoliate in a short period of time anyway. By orthodontically tipping the puppy teeth into normal angles, the eruption angles of the adult teeth are positively influenced. Like with extractions, brief anesthesia is necessary, but no surgery is performed and pain medications are not usually needed. For the adult pet, treatment options for base narrow canines include orthodontic repositioning, surgical repositioning, crown height reduction, and extractions. Depending on the severity of the condition, orthodontic repositioning of the base narrowed lower canines by application of an inclined plane bite plate or application of acrylic crown extensions may be considered. Orthodontic repositioning takes time to correct the condition but is a non-invasive procedure. Surgical repositioning is where the canine teeth are physically moved to a more normal position during a surgical procedure. The canine teeth height is decreased during the crown height reduction procedure. It is important to note that this is done concurrently with vital pulp therapy, otherwise tooth death and pain will likely occur. This procedure provides immediate relief from contact and pain but should be performed by a clinician with advanced endodontic skills. Finally, extraction of the lower canines can be performed. In this case, two large teeth are removed during the surgical procedure. Ideally, extraction should be performed in cases where the other treatment options can not be performed.